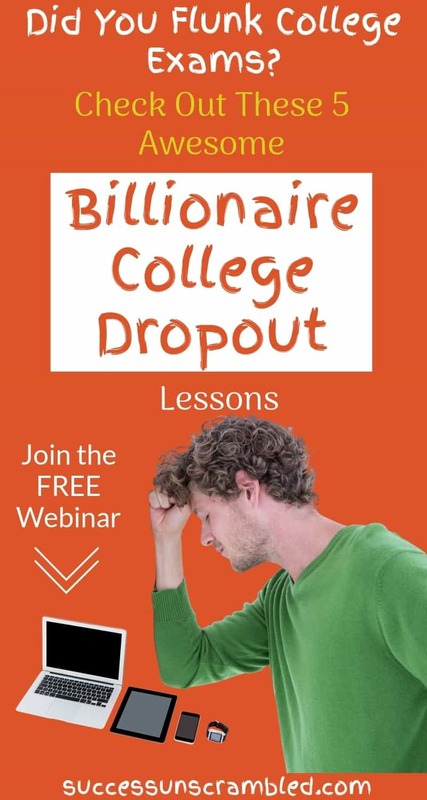 Does Bill Gates college dropout example present any hopes, dreams or lessons for anyone who is feeling like dropping out of college this year? 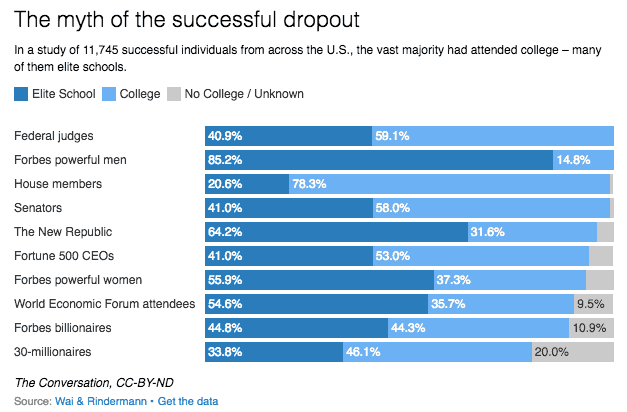 What are the statistics of college dropout success? In a study carried out on over 11,000 US leaders, it was found that 94% of them attended college while a remarkable 50% of them attended elite schools. There are approximately 325 million people living in the US of these over 214 million are working adults. I am curious as to how many of the remaining 213,988,260 consider themselves unsuccessful. I know that scientifically speaking the 11,000 people that were surveyed represents a good quadrant of the population but is it sufficient to prove that college dropouts are generally not successful? When you compare it to the other 213 million working adults the number of 11,000 does not seem to represent a fair average in the grand scheme of things. Should success be measured against one person’s accomplishments? Should we use the “Bill Gates college dropout” example as the ultimate pinnacle from which everyone else should be measured? Let’s spend some time looking at the story of Bill Gates as a college dropout. He entered Harvard in 1973 and two years later he dropped out of college to set up Microsoft with childhood friend Paul Allen. He went on to say that staying in school is a good thing. The only reason why he dropped out of college is that he did not want to miss the personal computer revolution. He is not the only successful person who is a school or college dropout. Here are 10 other well-known entrepreneurs who are college dropouts that continue to defy the odds. 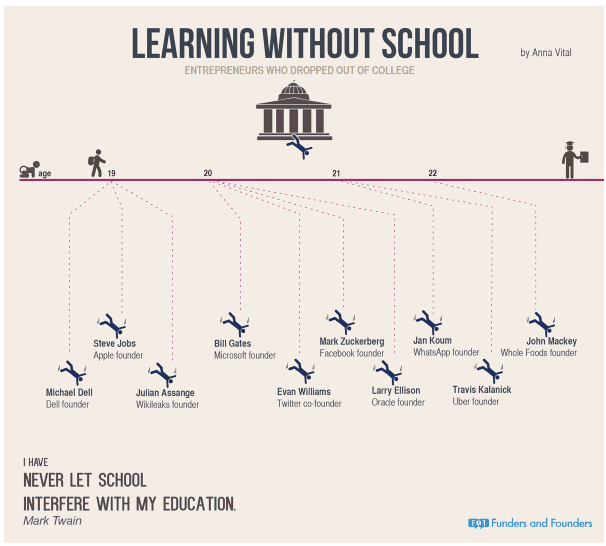 As you can see the founders of Apple, Uber, Whole Foods, Dell and Twitter are all college dropouts. So maybe let’s look at another example of someone else who is a college dropout. 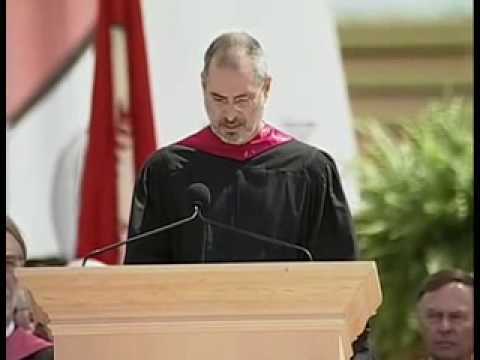 Steve Jobs dropped out of college at the tender age of 19. He went on in 1976 to build his first commercial product in his parent’s garage together with his co-founder Steve Wozniak. The product that they built was called the Apple 1. He did take a calligraphy course in college which he credited as the inspiration for beautiful typography on the Mac. As I am sat here writing this article on a Mac all I can say is thanks to the both Steve’s. Jobs went on to be the co-founder of Pixar after a falling out at Apple in 1985. He later reconciled with Apple in 1996 where he went on to make Apple a success. What we can learn from this story is that although college did not make Steve Jobs who he was it contributed to his success in some small way. I would encourage anyone who is considering dropping out of high school or college to stay there for as long as you possibly can as there are some key skills that can be acquired at these institutions. The truth is I have two degrees and I am thankful for them as I learned a lot of what I did not like in college. In fact, when I was at college I had no idea what I wanted to do. I finally found my passion but there was not a college course for it at the time I attended college. If you are not sure what your passion is yet then that is okay as you have lots of time to decide. The surprising fact is that you need to do what you love in order to be in that happy place where you are fulfilling your purpose and even serving the world with your talent. Many people believe that college is hard. I can tell you for a fact that finding your passion and purpose in life is even more difficult than college itself. Some people are lucky in that they have it all figured out as a teenager. Others don’t find it until late into their 40s, 50s and 60s. Most people have a small, very faint idea of what lights their fire but they are not sure about the specifics. For example, I knew I was interested in technology for many years but as to exactly what in technology I did not know. It was not until 10 years passed before I knew I had a genuine interest in digital marketing. I know what you are thinking, digital marketing is so broad. The short answer is I am still on that journey. It is so exciting to finally understand my passion and I invite you to do the same. Here are some things that you can do to help you on that journey. These are the things that helped me narrow my focus. I now have 3-4 mentors in different areas of the digital marketing spectrum and I am hoping to hire another 3-4. The vast majority of skills that I acquired for digital marketing I learned outside of college and informally via webinars and courses. How to Find a Mentor? If you are at the stage where you have no idea how to go about finding a mentor then have no fear I can guide you in this area as well. I spent several years looking for a mentor and the reality is they were all right under my nose. Everyone’s path to success is different so in most cases, a single mentor will not necessarily be sufficient at the start of your journey. The first step in finding the right mentor for this part of your journey is knowing what you are passionate about right now at this very moment. What would you like to get training about first? What are you most curious about today, this week, this month? If you are interested in learning something chances are you will go on the journey. For example, when I first started I wanted to learn how to create my own website. If you know anything about digital marketing that is probably something that is not necessary. However, I just wanted to learn to create my own website so much that I just had to get it done. It was only after creating the first website that I realised that I was more interested in the marketing aspect. Where to Find a Mentor? The best places to find a mentor is online. I did try several sites like themuse.com before I finally found my first good mentor. Writing – if you would like to become a writer but you have no idea where to start then I would recommend that you check out Elna Cain’s course here. Want to start a blog? Then you can take advantage of the start a blog in 10 days challenge here. Interested in driving traffic to your blog from Pinterest? Take advantage of this Pinterest for beginners course here. Are you more interested in becoming a paid marketer on Facebook? 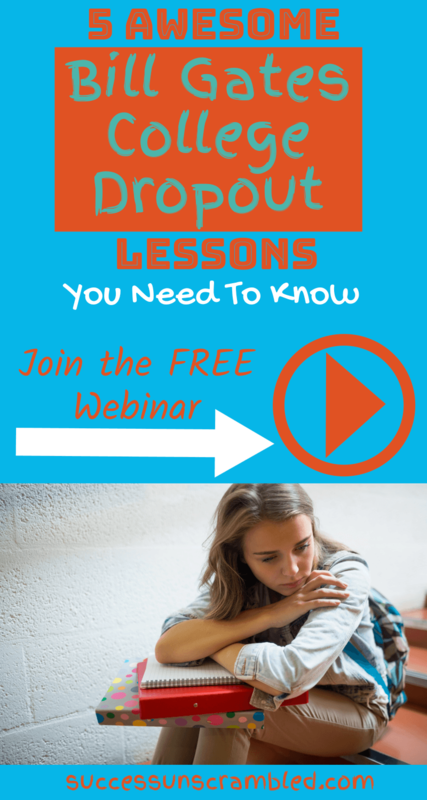 Then check out this free webinar here that will change your life in 12 months or less. If you are a new Mother and you would like to become a stay at home Mom then take a look at this cool course here that teaches you how to become a VA.
None of the courses requires that you have a high school certificate or a college degree but they do offer the opportunity for anyone with a passion for learning to implement what they teach in order to become successful. If you look at the example of Bill Gates and Steve Jobs none of them was given their success on a silver plater it took them many years of hard work to become successful. There are many paths that lead to success it is up to you to develop yourself personally by finding a coach and investing in yourself. If you need to motivate yourself to start your journey or even continue on that path to success here are seven books that I would recommend that offer alternative paths to success. It is important to not let society dictate the path you should take to become successful. Everyone should not need to gain the life they have always dreamed of by having a college degree. There are hundreds of alternative ways to legally become the person you are meant to be and fulfil your purpose here on earth. Subscribe to the Success Unscrambled Podcast where you will be the first to hear what’s happening in the entrepreneurial and digital marketing world. Your review of this podcast is vital to keeping it alive and running for the next 12 – 24 months so please leave a review for us on iTunes, Spotify or any of your favourite podcast players. In case you missed it check out the intrapreneur vs entrepreneur study as well as the #1 secret why an ultrapreneur are more successful than an entrepreneur. Want to take advantage of some free traffic to your blog from Pinterest? Check out my Pinterest SEO tips here. If you are a startup or small business and you need to hire a virtual assistant to complete tasks such as social media marketing, blogging, keyword research or Pinterest account management then take a look at these virtual assistant retainer packages. Do you want to pick my brain for 15 minutes? Book some time on my calendar here where I can give you 15 minutes of coaching for free in blogging, digital marketing, podcasting, Pinterest account management. Still Confused About Facebook Lookalike Audiences? Alvern, this was a great post with some really good insight. I originally dropped out of college after a semester because I was working full time. I am back in now, and it can be tough balancing everything. Although I am re-enrolled, I will be looking into your suggested books. Thanks! Nicole, I’m so glad it helped you in one way or another. I need to add one more book to that list. having a mentor is so important in life! whether with a degree or not, everybody needs some guidance in life. thanks for this inspiring article! I’m so glad you found it inspiring Patricia-Ann. Great post for another one who never finished college! I am in a different place in life than many, but have found great purpose and mentors (not really official) in knowledgeable friends who have guided me along my path. Great tips! That’s awesome Kim. I’m really glad you found great purpose and mentors. I am in a different place in life than many, but have found great purpose and few mentors thanks to him and his quotes which helps me sometimes.But sometimes what bothers me, people take it really wrong way when everyone says he is drop out and did achievements, people actually assuming that once drop outs can do much big tasks. But otherwise, I am happy I can learn so much from him. I’m glad you can learn so much from Bill Gates Aditya. I’m glad you found this inspiring Alexandra. It’s always great when you find a mentor. I didn’t quite finish college, but one day I hope to go back. I told my kids that they have to follow their own paths about college. I hope they finish, but I also cannot be a hypocrite. Amber, it’s so important to be a mentor for your kids as well. I almost feel sorry for teenagers as well as those in their 20s they have so many options that sometimes it feels like too much. I hope they all find a mentor before considering college. You are right Laurie college isn’t for everyone. I wish the education system offered more paths to success. I’m so glad that it worked out for you too. Having an amazing mentor really helps alot. I have friends who dropped out of college but she is much more successful than any other of us because she had great mentor. Now adays, you have so much resource online and webinars, I feel like you just need to find what you love and what you are passionate about. Soonjoo, you are right that there are so many resources online. The challenge is finding the one that is right for you as well as the mentor that is the right fit. My husband and I have this conversation all the time. 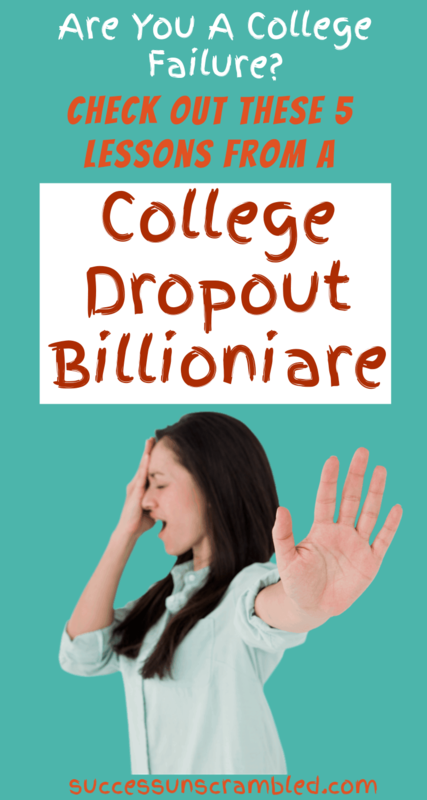 There are so many successful people out there that are college dropouts. I’m a college dropout and run a successful business and have the time to run my blog on the side. I wouldn’t pressure my kids to go to college unless there’s something else out there that they’re passionate about and can be successful at. So glad that you have a successful business without college Jenny. Thanks for sharing. I went to college, twice. I have 2 Bachelor’s degree (why not just get a Master’s, I don’t know). But this is great advice for those who dropped out! That is awesome Amanda, you may not even need the Masters. Most of the successful people are college dropouts. Thanks for sharing this motivational article!! Shirin, there are many college dropouts that are successful indeed. The reason we are homeschooling the kids is because we don’t want to confine them to classroom instruction. They are free to explore what they want to become in life. That’s awesome Sigrid, so glad you got the opportunity to homeschool your children. His advantage though, is that he was smart enough to make it to Harvard just start with. 😉 I think that is special from the get-go… you’re surrounded by people who think outside of the box. Yes Rosey, I would enjoy being surrounded by a group of people who constantly think outside the box. It really all depends on what you want to do in life and if school is necessary. But entrepreneurship isn’t for everyone. Yes Lynnette, it is true that entrepreneurship is not for everyone. Thanks for your feedback.